I have decided to watch some Japanese Dramas to get some extra listening experience for Japanese. After browsing through a bunch of Japanese dramas from a few recommendations , and at random, I decided to watch the Japanese drama “Trick”「トリック」. I just finished the second episode and so far I am still interested to see where this drama will go from here. 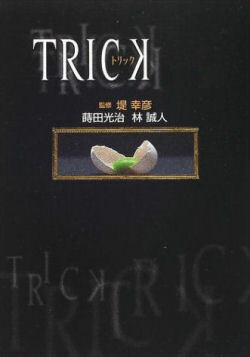 The main idea of “Trick” is based on a Physicist who does not believe in supernatural powers and a Magician who tricks people into thinking magic is real investigating a string of murders. At this point “Trick” keeps me wondering for a good period of time and later explains how things were done. There is definitely potential for this drama, so I have high expectations for it. Unlike 「日本人の知らない日本語」(The Japanese that Japanese People don’t know) the characters are not as relatable to the everyday people on how they act, and the situations they are in. Yet there are still enough aspects of personality, mannerisms and worries that manage to connect to the audience. I’m hoping for more intensity and interesting episodes, but I am worried that the story may run dry before the series ends. We will see. If there is anything in particular that you feel is worth checking out, or avoiding, let me know! Alright everyone, I started watching “The Japanese That Japanese People Don’t Know” (「日本人の知らないの日本語」）my expectations were not too high to begin with, and I thought that I would become bored pretty fast from the title… But was I ever WRONG! This Japanese Drama blew me out of the water with the great mix of personalities, playful attitude, seriousness when needed, tons of interesting aspects of Japan and daily life, and not to mention actual Japanese Language pointers! If you are looking for something to get into where you can watch it more than once, this is a definite 5 out of 5 on my list. What I really enjoyed the most out of this series was how it showed a group of people of all ages working for their dreams and all the struggles that were part of their journeys. So far we are off to a great start, and there are still about 30 different titles left for me to check out. If there is anything in particular that you feel is worth checking out, or avoiding, let me know! In case I haven’t mentioned it before I am studying Japanese in College as one of my Majors and I have decided that I am going to watch some Japanese TV Dramas to improve my listening skills (at least) for Japanese. I’m not sure what I’m going to write here yet, but I think i might post things that i find interesting about each episode, or series, that others might find useful, agree with, or not care about. whatever happens I think that, at the very least, some English speakers interested in learning different methods to study or enjoy the Japanese language will get some new ideas for things to watch that are not faaaaaar too difficult for beginners to intermediate level learners to understand. I recommend watching the shows in Japanese every time with English Subtitles. Then once you finish an episode, re-watch it without the subtitles, or watch it again with them, but try hard not to look!!! 😉 I know it is hard but I have found that it really does help. I have found a good 30 plus series that caught my eye. There is no way I will watch all of them, so I have decided to at least watch the first episode and post an opinion on them, as well as why I think what I do. That way you don’t have to waste your time if you were thinking about checking it out. For the ones that I like I will continue to watch them and post some random stuff on them. The first one I have started watching that I like is called “The Japanese That Japanese People Don’t Know” also know as 「日本人の知らないの日本語」(nihonjin no shiranai no nihongo). I think I will have my first posts up about it tomorrow if I have time.